Like the other HyperX headphones we have looked at, the CloudX set comes in a very impressive retail box. The outside sleeve is completely covered in images and useful information, as seen in the images below. Under the sleeve, the box itself is fairly plain, but made of some very heavy duty cardboard. Inside the box, the first thing you will find is some literature and a thin layer of foam padding. 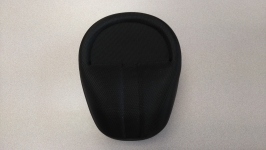 Under this padding is where you will find the headphones and their accessories bundled in a very cool hard shell case. You can tell from the shape of the case that they are meant to protect headphones, and they happen to be just slightly bigger than the CloudX set found inside. The case is covered in fabric, which makes it look like it might be soft, but this is definitely a hard case that should serve well to protect your headphones! 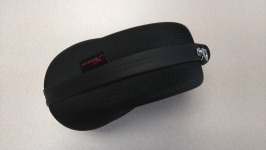 A zipper allows you to open the case as shown in the below right image. Here you can see the headphones and the handful of accessories that HyperX has included. 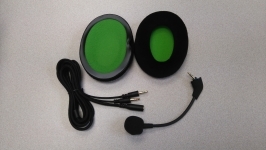 There is a set of foam earpads (leather-like ones are pre-installed), the detachable boom microphone, and an audio cable that serves as an extension and a splitter to separate stereo audio from the microphone (primarily for use with a PC). 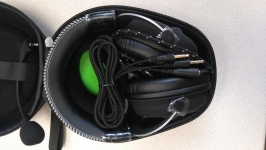 While the case is a big plus in my book, and way better than the soft bag included with the Cloud headphones, I do find that I have to move slowly when putting the CloudX set away. The cable coming out of the bottom of the left earcup barely fits in the case, and if you put them away hastily it may be sticking out and in the way of the zipper. I could see the cable being damaged if you weren't careful, and even while being careful I don't want to be bending that cable right at the interface with the earcup too much.